The Russian MAK Interstate Aviation Committee (IAC) issued their final report of the investigation into the cause of a CFIT accident involving a Tupolev 204 in March 2010, citing amongst others workload and poor crm. 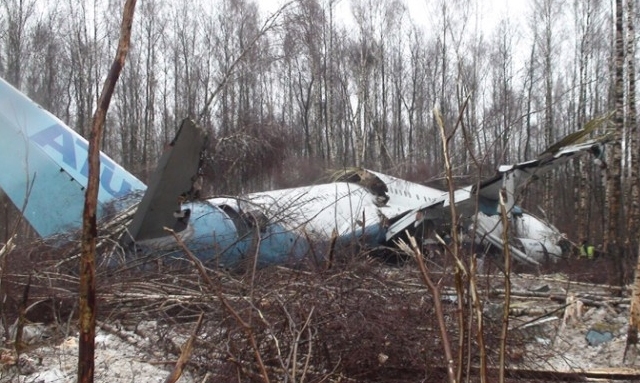 The Tupolev 204-100 passenger jet, registered RA-64011, was destroyed when it crash-landed in a forest on March 22, 2010 while on approach to Moskva-Domodedovo Airport (DME), Russia. The airplane operated Aviastar-TU flight flight TUP1906 on a ferry service from Hurghada Airport (HRG), Egypt. All eight crew members survived the accident. On approach to Moscow the flight was cleared for a runway 14L ILS-approach. Weather was reported to the crew as: visibility at the beginning of runway 1300m, mid-600m, at the end of 550 m, vertical visibility 60 m, wind 170 degrees, at 2m/sec. The airplane descended until it struck trees, cutting a swath trough the forest. It came to rest 1450m short of the runway threshold and 150m further to the right of the runway. – Unsatisfactory interaction in the crew, resulting in a descent below safe altitude. Failure of the flight control computer system in flight (most likely due to unstable radio altimeters at altitudes exceeding their operating range) and the impossibility of “removal” of failure on this plane because of the lack of buttons to simulate the compression of the undercarriage, and inadequate crew training, and possibly fatigue, led to a significant increase of mental and emotional stress in which it it is not possible to make the best decision for the successful completion of the flight.